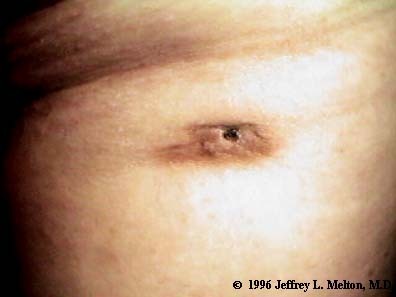 DFSP after biopsy. The small dark crust seen is not typical of the tumor, and resulted form the biopsy, performed about one week earlier. dermatofibrosarcoma protuberans's tend to be very firm, somewhat hyperpigmented dermal to subcutaneous nodules which grow fairly slowly. On palpation, they seem to have extensions deep in the skin, but these usually extend far beyond what one expects from the clinical examination.